The head of the Californian-headquartered wine giant Jackson Family Wines has expressed a serious interest in England for the group’s next vineyard investment. Owner of the company, Barbara Banke – wife of the late Jess Jackson who she built up the wine business with – came to the UK in June with five winemakers from Oregon to promote the Jackson family’s newly-expanded presence in the State through two masterclasses in London (one for trade and press and a further event for Masters of Wine and MW students). At the end of each masterclass, Banke was asked where she might consider investing next, and in both cases, she said that she was considering an English sparkling wine project. Although the comment might appear designed to appease her UK audience, in an exclusive interview with the drinks business following her final event in London, Banke expressed a serious interest in the creation of an English sparkling wine. Recording that she has been drinking English fizz in the UK during her visits to Royal Ascot (other than wine, her great passion is racing), she admitted to a love of the product, and a keen interest in its commercial potential. “I’ve been coming here for a number of years and instead of drinking Champagne to celebrate the victories of my horses at Royal Ascot we are drinking English bubbles, so I am very interested in looking at some of those vineyards and I’m going to be doing that tomorrow,” she told db. As for the character of the wine itself, she said that she liked what she had tried, but believed that the quality would improve as the industry matures. “I like the fruit and the restrained character [of English sparkling wine] and, as the vineyards age and the stock continues to age, the wines are going to improve,” she said. If the Jackson family were to invest in land in the UK, it would make it the first US wine company to buy into the English sparkling wine business, and one of only a handful of foreign investors in this fast-growing industry – the most notable of whom are Champagne houses Pommery and Taittinger. 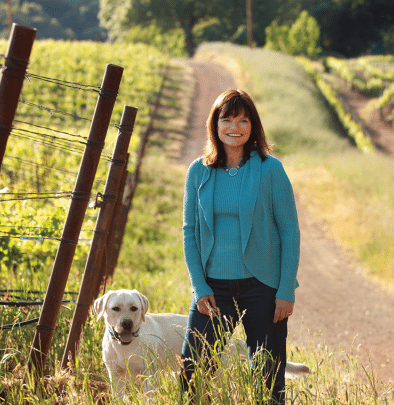 As previously reported by db, the Jackson Family has expanded its landholdings significantly since Barbara Banke became chairman of the business in 2011, taking a particularly strong position in Oregon, where the company now has five brands, two recently-created by the group – Gran Moraine and Zena Crown (named after two of the region’s great vineyards) – and three further that were acquired by the business since it first invested in the region in 2013: Siduri, Willakenzie and Penner-Ash. Banke has also moved Jackson Family Wines into South Africa with the 121-acre Fijnbosch farm in Stellenbosch, although she was already making Chardonnay in the region through a joint-venture with Anthony Beck from Graham Beck Wines. Outside the US and South Africa, Jackson Family Wines is present in France with Château Lassègue in Saint-Emilion, Tuscany with Arcanum, Australia with Yangarra and Hickinbotham, and Chile with Calina. Bread and butter for the business is, however, the Kendall-Jackson brand, which includes the Vintner’s Reserve Chardonnay – America’s best-selling Chardonnay, with around 3 million cases sold annually. Even if Banke’s interest in English sparkling wine does not result in the purchase of land or an existing brand, it proves that the fast-growing industry is being taken increasingly seriously by major producers outside the island nation. Indeed, speaking to db in April this year, Chapel Down brand ambassador James McLean said that he believes the investment in English land by Champagne houses with the view to making high-end English sparkling is “just the beginning” and that we’ll see similar foreign investments in the near future. “English wine is gaining respect both within the wine industry and internationally, and the Taittinger investment was great as it shed light on the industry and brought attention to our wines,” he stated.